The arnica infusions are wild crafted using fresh organic Arnica Cordifolia and all natural ingredients. • Pain relief and inflammation from insect bites or stings. 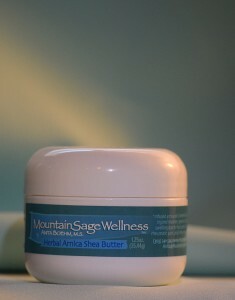 Makes an excellent massage oil for sport injuries & sore muscles, as it helps to reduce bruising & relaxes tense muscles. Do not apply to open wounds. Prolonged use may lead to dermatitis or eczema, so for skin conditions, use sparingly.